In a medium saucepan over medium heat, combine the garlic and oil. Cover and cook until the garlic is browned all over. Stir occasionally. While the garlic is going, bring 4 quarts of water to a boil in a large pot. Once the garlic is browned, add the broth, balsamic vinegar, ¾ tsp salt, and ½ tsp pepper. Bring to the garlic mix to a boil. Reduce the heat to low and simmer for for about 5 minutes. The garlic is ready when you can easily stab it with a fork. While your garlic is simmering, your water should have come to a boil. Salt the water generously and add in you spaghetti. Cook until al dente ( about 8-10 minutes). Reserve 1 cup of the pasta water. When the garlic mixture is finished, transfer it into a food processor. Blend until smooth, about 1 minute. Drain pasta and return to the pot. Pour the sauce over. Add some of the reserved pasta water if you’d like to thin out the sauce. 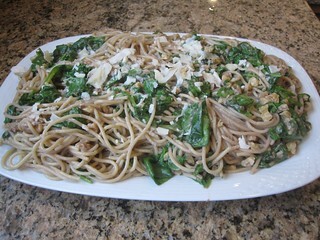 Mix in the arugula and chopped walnuts. Sprinkle with cheese.